I wish there were some sort of taste sensor that could reach through the computer and allow you to experience just how incredible these yummy roasted veggies are. I love roasting veggies, but I honestly had never tried roasting parsnips and I had never roasted carrots in long strips like this. They were so delicious; crunchy with just the right amount of natural sweetness. I couldn't stop eating them. Even better; my hubby and little "R" were fans as well. These would be a perfect side dish to any fall meal. I also thought they would be a great healthy Thanksgiving side dish. 1. Preheat the oven to 400 degrees. Line a baking sheet with tin foil and spray with cooking spray. 2. 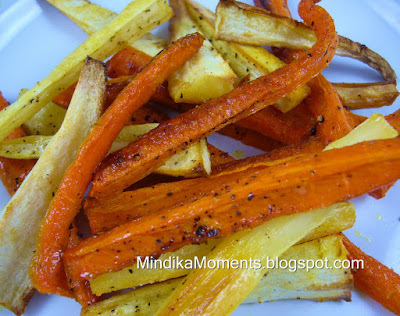 Cut the carrots and parsnips into long strips about 3 inches long and 1/4" thick. 3. Toss the sticks with olive oil and sprinkle with salt & pepper. 4. Arrange in a single layer on the prepared baking sheet. 5. Roast in the oven for about 45 minutes or until nice & crispy. I definitely need to try this one. I've never tried parsnips but I trust you! I'm sure it's healthy deliciousness.